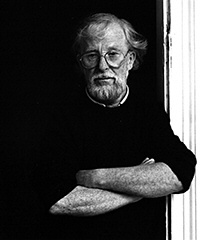 There are known to be three games that Ken was contracted to design. 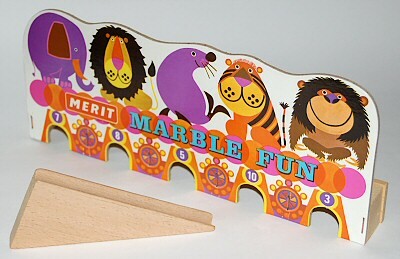 A simple scoring game where a marble is run down a slope and points are awarded according to which slot the marble passes through. 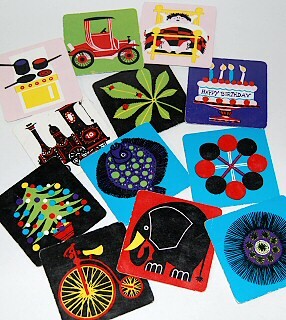 Features dozens of square cards, all featuring the familiar KT-style designs. Some designs are adapted from the Scenes of London and Menageries series of tiles. See these six examples of cards. The photo, below right, shows just a small representation of the designs. 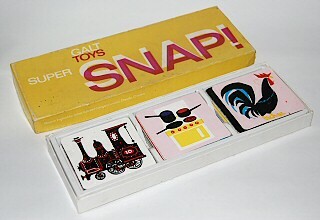 According to Heather, this was the first game produced and some designs were used for the Snap! game.